Everyone knows cilantro, but they may not know that coriander is the seed of the plant. Both are commonly used medicinally. While the leaf is cooling the seed is warming and both are good for simply household problems, specifically those pertaining to the digestion, respiratory and urinary tracts. The leaf is most indicated for detoxification from heavy metals. 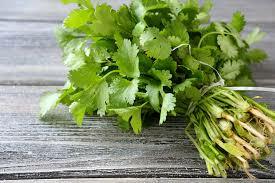 Cilantro is most commonly used in cooking but can also be juiced or made into a tincture using the fresh leaf. If you want to eat fresh cilantro year round grow some indoors. Cilantro makes a great addition to salads, guacamole, salsas, and rice dishes. Try this delicious Cilantro Lemonade. And here’s a recipe from Brittany Nickerson for a Coconut Fish Chowder with Lime and Cilantro. Cautions/Contraindications: Some sources claim there are no adverse side effects while others warn against using cilantro during pregnancy.